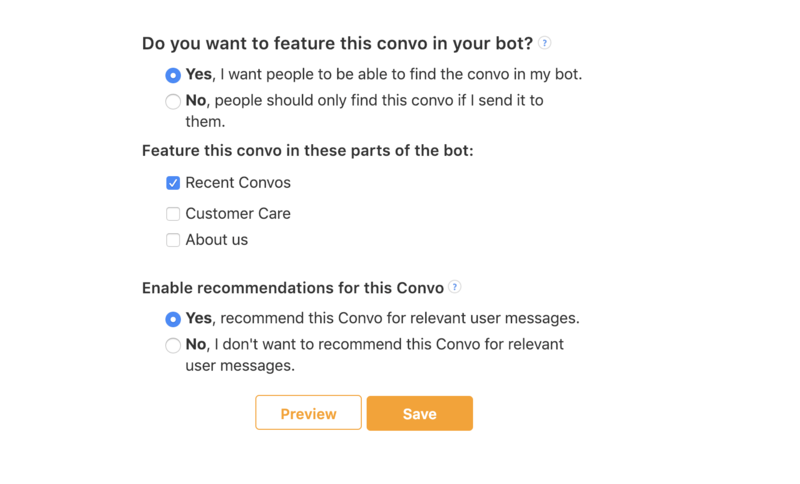 When you are publishing a Convo, you will be asked whether or not you want to feature it in your bot. If you do not want to feature it then the only people who will be able to find it are people you send the Convo link to directly. If you do choose to feature it you will get to choose in which topic you want to feature it. By default it will be featured in "Recent Convos" which shows all featured Convos, you can also choose to feature it in any other topics you created to organize your Convos. You can also choose to have the Convo by recommended based on customer messages. This uses our Convo Recommendations feature to help your end-users find relevant Convos. Learn More about Convo Recommendations.